Like Rapunzel, I had a dream. It was pretty simple, really. I didn’t want riches or fame, I wasn’t dreaming of winning gold medals or running 4 minute miles. I dreamed of one day being able to stay at the Polynesian. Preferably for free or dirt cheap. That last part was where the dream usually ended. It’s not cheap to stay on the monorail at Disneyworld, but man, oh man, it is soooo worth it! At least that’s what I assumed since I had never stayed on the monorail. But my funds for races are usually limited to the Value options, so this was to remain a dream. I managed to book the RGR (Moderate price hotel) due to a sweet Annual Passholder discount that happened to fall during my weekend stay. I was moving up in the World— though not as far up as I wished! While dropping my daughter off at swim practice one afternoon the phone rings. 407 phone number. Well, that’s Disney! And I had been playing one of the sweepstakes games where you text for a free trip (One More Disney Day) religiously for the past month, so… HOT DAMN! Not so fast, Shenanigans. Answer the phone first. Turns out it was the lovely Debbie, a CM from Disney Travel. I sadly did not win any sweepstakes. At least, not in the form of the free trip. I did however win a sweepstakes of another kind- the RGR would not be ready as promised for my trip. Debbie was very sorry and sad to inform me of this situation. Frankly, she sounded more upset than me. Sweet little Debbie. I was a little sad too, but not expecting anything to come of it other than moving me to a regular room at POR. Imagine my thrill and surprise when Debbie transformed into Tinkerbell, sprinkled me with Pixie Dust, and offered to move me to the Polynesian as a way to make up for the RGR not being ready. Um, do I mind? I think I stuttered out an… um, yeah, I guess that would be ooookaaayyyy… She explained that since this was their mistake not only would I get moved to the Poly, but I would not be charged Poly prices. I ended up paying the Moderate Annual Passholder rate for a Deluxe room. BOOM! Okay, so now that that was all sorted out… on to the actual race. I had high hopes for this one. I felt good going into it, I had a successful “training race” a month before, and I knew I had done all the work. It was time to become a true princess and earn that golden crown medal. My sister was under the weather (ahem- cough cough- she didn’t train- cough cough) and chose to sleep in rather than join me at the start. Whatevs. I had a race to run. 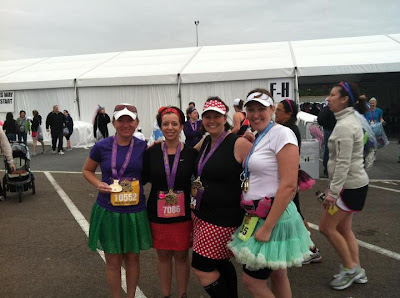 Dressed in my Minnie Mouse skirt, my black arm warmers, black tank, my black compression sleeves and my Minnie Spibelt, I was ready to hit the course running. Walked over to the Great Ceremonial House and boarded a bus with a couple other princesses around 3:15am. By all reports, I beat the rush as people getting up just a few minutes later were stuck in traffic snarls on the way to the start. No Bueno. 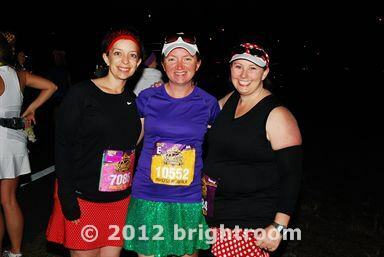 Rule #1 for running the Princess: be an early riser and get to the start area ASAP. Better to wait there than sitting in traffic wondering if you will get to the start, right? 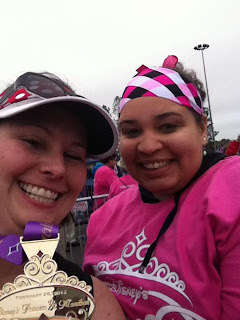 Once I got to the staging area, I went over to the H bag check area and met up with my fellow Princess and Mother Runner, K. K didn’t run with us the first year as she was recovering from baby #3, so this was her first Princess. We waited for a long time, and K was getting chilly, so we finally decided to move past the bag check and into the porta potty area, heading towards the corrals. Just as we got to the other side, MR A showed up, and we heard from MR S that she was stuck on the bus in traffic. Yikes! So with A and K with me, off we moved to the corrals. At a snails pace. This was a different set up than the year before and there was a huge bottle neck holding up thousands of Princesses trying to get to the corrals. Rule #2 for running the Princess: go ahead and head out to the corrals early. There is usually a cut off time that Disney wants you in the corrals- it sounds way early, but trust me, get to the corrals. It’s worth it. The last thing you want to do is earn a start in A or B corral, and be forced back in the H corral because A and B already took off by the time you get to the starting areas! It happens to a lot of unhappy Princesses who misjudged the time. Don’t misjudge the time- get to the corrals early so you are assured your starting spot. After a quick dash to the bushes to relieve my teeeninnnnyyy bladder (damn, there goes my Mom’s Panel spot again this year!) we posed for a picture and broke off to our individual corrals. The race starts with all the magic of Disney. Fireworks! Fairy Godmother! Characters in jogging suits at the start! Woooo hoooooo… here we gooooooooo!!!! It never happened before and I pray it never happens again. I had to make an emergency porta potty stop right at mile 1. And again at mile 2. And mile 3. Thankfully I was able to get to the porta potties (the 2nd set were on the other side of the road, but not too hard to navigate to) before any damage occurred that I would never be able to live down. At one point I sent a tearful text (if there is such a thing) to Mr. Shenanigans telling him this was “not. good. at. all.” Holy misery, batman! Thankfully, it passed (ba dum dum) and as I hit the 5K mark (terrible soul crushingly slow time, I might add!) I was feeling much better. 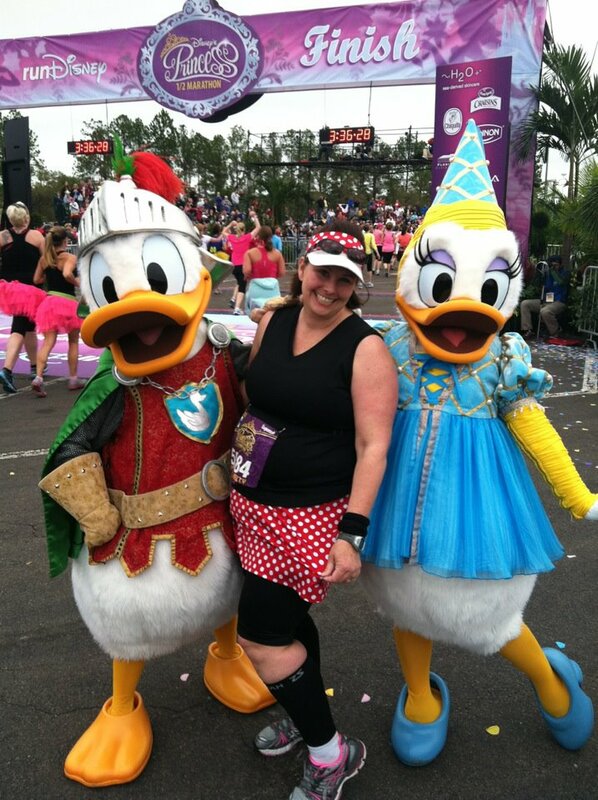 Once I hit Main Street I was really feeling the vibe and was so happy to be running this race. It was still a little dark even. Last year I walked up Main Street in the daylight because I was so slow. Speaking of slow… we got through the MK and I felt the need to slow way down. Happens on all my races and training runs- I get to 6+ miles and I bonk. I slow to a walk. My intervals were turned off and I just had some walking time. I wasn’t upset about it since I knew it was coming, I was just hoping this race I could push through it. I could not. So I enjoyed the costumes and shirts of the runners flying past me, moved over to the far right side of the road, and kept on walking. One of the fun things about the Disney races is that you can sign up to track runners on the course through text messages. It was around this point I saw that MR A and MR S had made some great times and were close to the end. MR K, starting a bit farther behind me in the corrals, was also doing well and I began to look for her. Sure enough… there she was! K’s intervals were walk .25 mile, run .25 mile based on her Garmin, so she was in a walk break when I ran up to her. We chatted for a bit and it was really nice to find my friend on the course. When her time was up, she was gone, and once again I was the lone MR bringing up the rear. I’m slow, I know I’m slow, and I am really ok with being slow. I don’t like to think of my speedy friends waiting around for me to finish (which they always do- God Bless those ladies!) though, so I started to pick up the pace again around mile 9. Back to the intervals 1:1. The rest did me good, I got a Cliffs Shot and some water and just knew it was the caffeine vanilla flavor that kicked me into gear. This run was NOT done and I still had the hills to climb! Game on, Princess! My favorite spot of the course is also probably the most hated spot by most runners. It’s the clover leaf on ramp we run around mile 10. Why do I like it? Simple… this guy. Once we get to the top of the hill, you pass over the road you just ran. It’s pretty cool to see ALL THOSE PRINCESSES running along! A sea of tutu’s and sparkle skirts as far as the eye can see. At least it was a sea this year. Last year it was more like a small stream during a drought. Yay for progress! Closer to the end and I was smiling. Remember the area where the bike sweepers flew past me in 2011? They were no where to be seen. But I did spot a few of my make believe friends (ie, people I met online but never in person) in the crowd at this point. Leah Powell, the genius behind Sparkle Skirts, was just in front of me. I recognized her from the expo on Friday. I caught a glimpse of her before she powered up the last overpass and into Epcot. I also recognized Tinker Amy and SaySay from the Disboards. Amy’s blog is here to read about their Princess adventure (in 3 parts) Their costumes were GREAT and they were clearly having a ball stopping for each character and getting pictures. Someday I want to be fast enough to run with them, because they were clearly having too much fun during a 13.1 mile race! Yes- we all started in the same corral, and yes, technically I finished before them, so yes, technically I could try to claim to be as fast as them. But… count their pictures, yo! They stopped a lot. I stopped for picture(s)… once. They made up that time somehow, and it wasn’t by walking miles 6.5-9! Now the good stuff. I loved this last mile through Epcot. 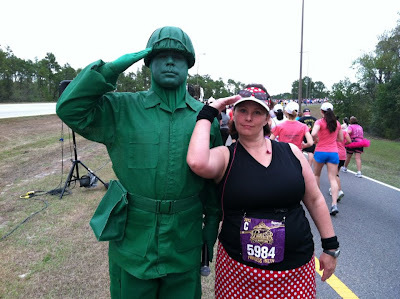 Last year I was in so much pain and really hated everything about this race by the time Epcot came around. I just wanted to get DONE. This year- it was all different. I enjoyed it. 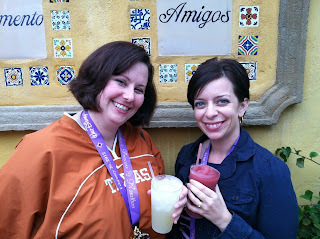 I loved the fountains, and running under Spaceship Earth, seeing the Gospel Choir (again!) and heading for home. Almost there… almost there…. And then I was there. Stopping for my finish line picture with Donald and Daisy this year, and crossing the finish line relatively pain free. I was hoping to finish in closer to 3:15, and I didn’t make that, but I was still pleased to be an official time finisher and a real, live, running Princess. My MR group was there waiting for me… again. I suspect this will be an annual concurrence for them until I get my weight off and my speed up, but again, that’s what friends are for! I really loved the purple ribbons this year. It made the medal sparkle so majestically, no? Off to the hot tub (at the POR, yes, I pool hopped with my pals, don’t judge!) I tried ice baths and those just didn’t help my poor legs at all. A hot bath, on the other hand, really seemed to ease the pain, so I went with what works for me. After a good soaking I went back to the Poly and showered, changed, and met up for some Epcot park time. Viva La Mexico! And dinner with the Princesses (of course) in Norway to follow.